Unpack it in a folder of your choice, set the path and edit fpc.cfg accordingly. Refer to readme.txt for more infos. More, download the new gbalib for fpc that you can find *here* and copy all file in your freepascal\units\arm-gba directory. 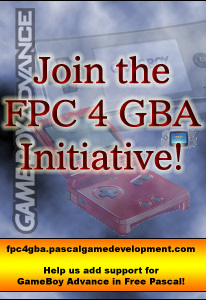 Get the FPC4GBA Batch Builder. Install the freepascal binaries, then unzip the binutils in a directory of your choice and the fpc sources in another directory. 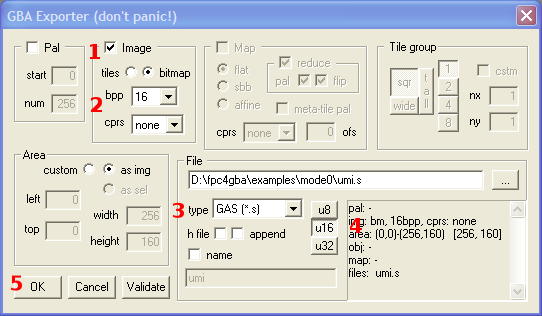 Edit the batch builder accordingly, by providing a folder where you want to install your fpc4gba copy. Save and launch the batch file. If you are lucky, you will get a congratulations message stating that all went right. The last step is to add your fpc4gba bin/arm-gba directory to your search PATH. If you can't get this batch file working, feel free to contact me. In all cases you can follow the step-by-step guide you will find here. - A text editor of your choice. I use PSPad, but any other editor should be good. - A graphic file editor/converter. I suggest Usenti, that can resolve all your problems. - A tilemap editor. You can try TileStudio. ARM7TDMI @16.78 mhz. This cpu has two different instruction set: ARM (32 bit) and THUMB (16 bit). ARM instructions can do more stuff in a single command, so it should run faster. A THUMB instruction is reduced to 16 bit so it can be executed directly in ROM in a single cycle, because the bus size to ROM is 16 bit too. Unfortunatley, at the moment I'm writing this tutorial, fpc can handle ARM instruction set only. EWRAM: (external working ram) starts at $2000000 and is 256kb wide. It can be accessed in read/write mode at 8, 16 and 32 bit in two cycles. IWRAM: (internal working ram) starts at $3000000 and is 32kb wide. It can be accessed in read/write mode in a single cycle (so IWRAM is faster than EWRAM), at 8, 16 and 32 bit; all your variables and the stack normally should go here. IORAM: (IO registers) starts at $4000000 and is 1kb wide. You can control all GBA hardware by setting or unsetting bits in this section. PALRAM: (palette memory) starts at $5000000 and is 1kb wide. It contains ttwo color palettes of 256 entries of 15 bit each. The first palette is for the background, the second one is for the sprites. VRAM: (video ram) starts at $6000000 and is 96kb wide. According to video mode, this memory is divided in different way between video memory and sprite memory. The video bus is 16 bit, so it should be a good idea to write video memory 16 or 32 bit at time. If you try to write 8 bit at time, they will be aligned to 16 bit boundaries, so the same data will be written two times instead of one. And this is BAD! OAM: (object attribute memory) starts at $7000000 and is 1kb wide. In this section you can control sprite attributes. ROM: (read only memory) starts at $8000000 and is max 32Mb wide. As its name says, it can be accessed in read mode only. GBA has 6 different video mode, 3 allowing single pixel access and 3 allowing handling tiles via hardware. In next few chapters we will see how to use all these modes. Bitmap mode allows to access every single pixel of the screen. You can assign a 16 bit color value or an index value to it, that represent the index in the palette of the color you want. Let's look at bitmap modes a bit deeper. Nice, but slooowww! Don't worry, You will use this mode for static screens only. You should have noticed that it is possible to see screen rows being updated, and that looks bad... A trick could be to set Mode 3 *after* that you have filled the video memory. Note that I am using an u32 for a loop varialbe: the gba is a 32 bit machine, so works faster with 32 bits variables. VideoBuffer[i] := u32(mode3bmpBitmap[i]);  //Note u32! We need to cast our bitmap to u32, because we should read and write 2 pixel at time. In this example the screen is refreshed very slowly too, but don't worry! As I already have said, we will introduce a method that will decrease drastically memory reading and writing time access. Because of VRAM needs to be accessed 2 bytes at time, we need all that typecasts. In the next example we'll try to make a simple animation, by using a page flipping system. Get the frames of an animation you want to show and open the images fame by frame with Usenti. Compared to previous example, you should check 'append'. In this way, you will get an unique file with palette array and a big array with all images. Note that I have added a call to Wait() function in order to slow down the execution speed :). We are using an asm optimized routine (memcpy32) that copies our 32 bits data in the right memory location (for 16 bits data, there is memcpy16). However, for small amounts of data you can use a loop, as you can see in the example for palette filling. This isn't the only way to move around data chuncks, because the GBA BIOS allows DMA copy, that is faster than memcpy, but its execution stops the CPU. This can cause problems with interrupts, so pay attention when you are using it. (Phew) So: each 16 color tile takes 32 bytes. What about 256 colors tiles (that you need for advanced mode)? In this case, we need 8 bits in order to specify a 256 index value for the palette. Now you should have an idea about how tiles are working in memory. Of course you can't store tiles and maps in the same memory location, so be careful: overlapping is a bad thing! The memory taken by a tilemap varies, according to screen size and standard or advanced mode you are using. How much blabbing... Well, now we can try to go deeper in tile mode, showing some small examples. Basically, the three tile modes are pretty similar, so we will analyse the differences between standard and advanced background only. This small demo shows on the screen a couple of tiles. Nothing too fancy... the only things you should note are the register REG_BGxCNT, that is used to set the BGx properties, and the loop used to fill the tiles, that writes two bytes at time in a single step, by adding and shifting here and there. The code is full commented, so you should not have trobules. Showing something more elaborated paradoxically is even simpler, because we don't need to fill the tiles two bit at time, but we can use some useful gbalib functions. Let's look at a nicer example that uses 3 bg. FPC does not support some features that you can find in gcc-aimed source code for gba. FPC does not allow volatile declarations. Just ignore it, because fpc compiler does not handle a such optimization. where %FreePascal% is the path of your fpc binary installation. !!!Disclaimer!!! Read it carefully!!! : All the software you can find in this site is provided as is. I can't be considered responsible for damages caused directly or indirectly by my software. 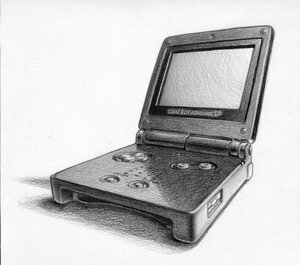 Gameboy, Gameboy Advanced, Nintendo DS are trademark of Nintendo. I'm not related to Nintendo in any way and all informations you can find in these pages come from reverse engineering, search'n'try and from publically and available docs.